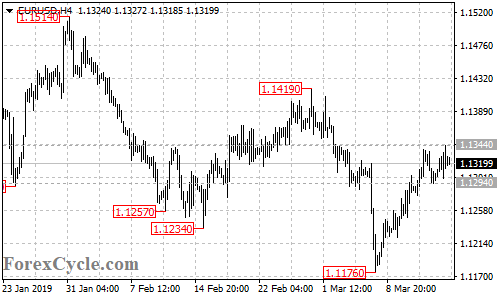 EURUSD moved sideways in a trading range between 1.1294 and 1.1344. As long as 1.1294 support holds, the price action in the range could be treated as consolidation for the uptrend from 1.1176, further rise towards 1.1400 is still possible after the consolidation. On the downside, a breakdown below 1.1294 support would indicate that the upside movement had completed at 1.1344 already, then the pair would find next support level at around 1.1230.